This is FSM's greatest release ever! Lukas Kendall is the Pike Bishop of soundtrack! I bought the first FSM title and, now, I will buy the last title: the cycle is complete! My only question: How did this become common knowledge in the past few months, given that there were no clues at all? The same thing happened when Varese released the EYE OF THE NEEDLE. Wow, not what I was expecting for the end of FSM. Might purchase some of the "less than" titles, but will let others have this release. Not a Fielding listener. Before us stands the "Finale and End Credits" of our beloved FSM CD label. I don't really know this score, but as a finale and as thanks to Lucas, it is ordered. This release is not for me - but I have to congratulate Lukas and all the team at FSM for giving us so many marvellous, rare and exciting soundtrack releases over the years. I will miss the black and white CD spines in the future! Looking over my very modest collection I see I have only 16 titles out of FSM's 250, but they are all gems. Congratulations and best of luck to you in your future endeavors, Lukas. Silly question: third edition was needed, if I do wrong account "THE WILD BUNCH"????? I expect a magnificent edition of "The Ten Commandments", like that of Ben-Hur. or other flagship title that was not yet able unedited. Anyway, I prefer the previous edition, because I see no point in re-buy this soundtrack, but now come fully complete. Lokutus Like, I'm a little disappointed. Who does not have it and you like the style of Jerry Fielding antimilitary, who buy it. Excellent work of the great Jerry Fielding, to a very great Sam Peckinpah film. If anyone else feels they're being taken for a mug paying $6.25 local shipping from SAE, they might like to know Intrada ships the same set for $5.55. 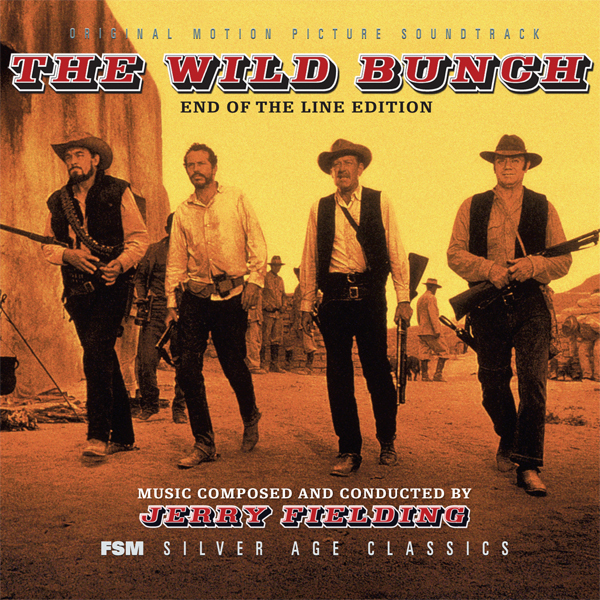 FSM began with David Shire's Pelham and ends with The Wild Bunch, two of my all-time top 10 scores! A big thank you to Lukas! Really you are going to complain about .75??? While this particular release may not be for me, I want to use the opportunity to thank FSM for a great run and an impressive line of releases. If it hadn't been for you guys, we would never have all those previously unreleased Williams gems out there, for example. "So Long, and Thanks for all the Fish!". Bravo, bravo, Lukas. THE WILD BUNCH is the greatest achievement. This is FSM's magnum opus. I love that "End of the Line Edition" caption! Thank you Joe for your supreme artwork! ps congrats to FSM for a great run! This will be ordered shortly -- one of my favorite scores from one of my favorite films. I've missed all previous CD releases of the score (just have my trusty LP) -- so this is essential for me. Thank you, Mr. Kendall, for this and all previous releases -- and wishes for huge success in all future endeavors. P.S. I did a quick count -- I only have 60 FSM CDs (including "The Wild Bunch") -- so obviously I have to scrape up some funds to increase that amount with a few of the soon to be OOPs! So how many copies are there??! Back cover says 2000 and info text N/A. 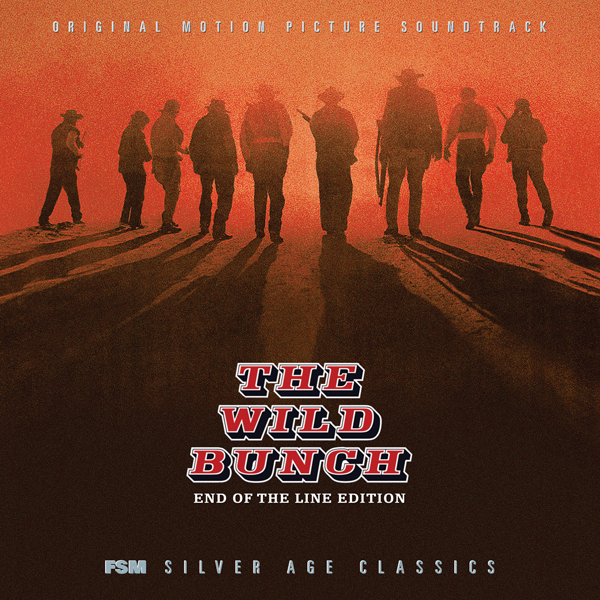 Bravo and congratulations for The Wild Bunch - a major release of a very special composer's work that so fittingly encapsulates the character of Film Score Monthly's output over the years. The label has been an enormous asset to the preservation and international promotion of great film music. Anyone who values this art form owes Lukas and his wonderful staff so, so much. All that's left to say is thank you and good luck for the future. Oh... and of course ordered. Same as you would if you walked in the post office to buy $1-worth of stamps and they charged you $1.75 for them. Or maybe you wouldn't. Perhaps you'd consider it a well-deserved tip. I found it very touching... Too sad we're never going to see another FSM release. I for sure am going to miss these fine releases. Yes, it is the end of an era but at least Lukas is still very much active!